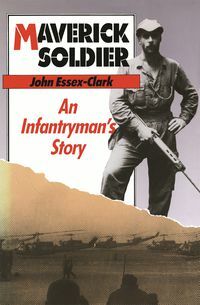 John Essex-Clark was born with soldiering in his blood, but his professional life has not fitted the orthodox mould. His interests range from rugby and cricket to sketching. He is a man of action, impatient with introspection, yet always with him at the battlefront were his thesaurus, book of quotations, complete Shakespeare... He is indeed a maverick. After 34 years of military service, John and his wife Lilian built an eyrie in a hill-top on the northern New South Wales coast. John writes, gardens, works as a consultant in military and strategic matters, and contributes generously to local community affairs. He is happily entrenched.